Left to right: Emir Abdul Jalal (Chief Operating Officer, Le Tour De Langkawi), Dato’ Kay Prakash (Vice President Corporate Services, Resorts World Genting), Dato’ Seri Zolkples Embong (National Sports Council Director General) and Dato’ Hj Abdul Jalil Abdullah (National Sports Council Director of Sports). HAVING been on the map of Le Tour de Langkawi seventeen times out of eighteen editions of the race, Genting Highlands tops the list of the stage finish locations in the history of the event, followed by Kuala Lumpur, fifteen times, and Langkawi, twelve. For the 19th edition of LTdL, Genting Malaysia Berhad once again continues its sponsorship with a contribution worth RM 800,000.00 in cash and kind, to ensure the success of the ‘Hottest race’ in Asia. Genting Malaysia is also the sponsor for the red KOM jersey. Genting Malaysia’s Vice President, Corporate Services Dato’ Kay Prakash presented the mock-cheque and LTdL 2014 KOM Red jersey to the National Sports Council Director General Dato’ Seri Zolkples Embong at LTdL Headquarters, Bukit Jalil. 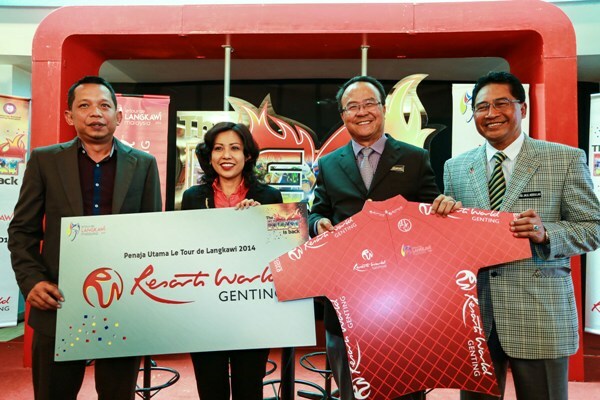 “Genting Malaysia has been a ‘traditional sponsor’ for Le Tour de Langkawi for the past 19 years. This year, once again we are proud to continue our support as the main sponsor and also the sponsor for the King of the Mountain red jersey, which is the much sought after win among the riders. We are honoured that the Genting stage has the distinction of being known as the ‘Queen-stage’, from which a champion will emerge,” said Dato’ Kay Prakash. “From its inception in 1996, we have seen this local event grow and gain recognition at the international arena. We are pleased to be a part of this driving force that attracts cyclists and teams from all around the world to participate in Asia’s best cycling race,” added Dato’ Kay. Among the riders who were first noticed on a world scale because of performing at LTdL and Genting Highlands remain the big names of Paolo Bettini, Jens Voigt, Alexandre Vinokourov, Alessandro Petacchi, Levi Leipheimer, Chris Horner, Thomas Voeckler, Floyd Landis, Paolo Lanfranchi, Tom Danielson, José Serpa, José Rujano and more recently Chinese sensation Wang Meiyin.